Gaming gives you a load of real-life experiences from its gripping visuals, to the feel of the merchandise, to more natural gaming experiences, and faster recharge time. And to do that, innovations in gaming accessories have been made to make your gaming experience the best one. Here are three great gaming accessories to have to maximize your experience. Much like DualShock 3, the DualShock 4 has tilt controls, vibrates, has a built-in rechargeable battery and doesn’t contain any fewer buttons. The R2 trigger buttons are curved inward unlike its older version, and along with its shape and size, this makes it much easier to hold and built to cater almost all hand sizes. DualShock 4 sets itself apart from other controllers by its additional features, which but you won’t find in other controllers. The first addition is its touchpad above the analog sticks. The new multi-touch and clickable touchpad on the face of the DualShock 4 Wireless Controller opens up worlds of new gameplay possibilities for both newcomers and veteran gamers. The DualShock 4 has a built-in speaker and stereo headset jack, putting several new audio options in the player’s hands. This brilliant feature allows you to listen to listen to all in-game audio without bothering anybody or having to pay for headphones or a long wire connecting to the TV for your headphones. Controllers are great, but if you feel you’re not getting the best out of your racing games, then investing in a racing wheel for gaming may be the best option for you. If you want a good item for a racing car game, Logitech G920 Dual-motor Feedback Driving Force Racing Wheel with Responsive Pedals for Xbox One is the wheel for you. It works with XBox One and PC. It has Dual-Motor Force Feedback meaning that when driving it gives vibrations back giving you a ‘real’ driving experience. The wheel feels nice in your hands and turning is relatively precise with its 900-degree rotation. The Logitech G920 has easy access game controls, responsive pedal unit, and mounts securely. Now if you got the best controller for PS4, you’re going to need an excellent charger to go along with that. And if you love playing video games a lot, and spend a majority of your time playing, you know that playing video games does something horrible to your controllers. It murders your batteries, burns it, drains it, etc. So the PS4 controller charger by YTEAM is a great charger to use because it’s rather small and lightweight and straightforward to use. It comes with two parts, with the charging dock itself and the stand. The clear plastic holders help guide the controllers efficiently into the charger plug. It comes with the USB cable, the one you use for the PS4 controller. So just plug it into the PS4 cable, and it charges very fast. Want to be able to check out the latest gaming tech yourself before buying? 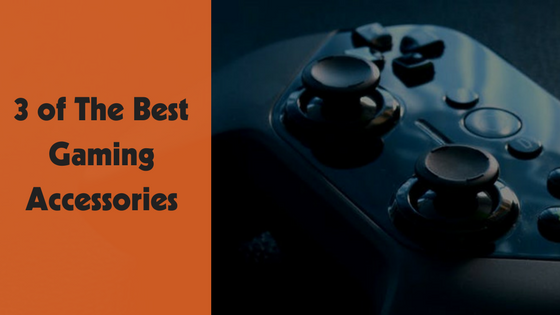 We’ve listed out four gaming accessories to check out to maximize your gaming experience, but if you don’t trust our word for it, you can check out these accessories and more without paying all the money buying them yourself. Plan a mobile video game party at Game Truck Jacksonville today; our certified Game Coaches can give you the best advice you need for the latest tech for the lowest prices. Here we have the newest gaming consoles including XBox One, PlayStation 4, Wii-U, and Nintendo Switch along with gaming accessories you need to give you the best gaming experience. To learn more and get a free estimate, you could go on our website or call (866)253-3191.